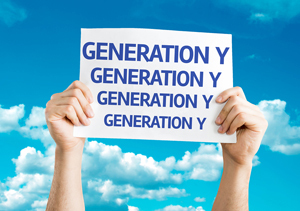 Generation Y: Using the birth year range of 1980 to 2000, Gen Y consists of approximately 79.8 million people in the U.S. These are generally accepted as accurate figures and if they aren't accurate, send a Gen Y a text and ask them to Google it because they seem to spend all their time online, on their phones or... no, wait... that about covers it. They are the fastest growing demographic in the workplace as well as the marketplace. Globally, Gen Y is an emerging adult population that is gradually exerting more influence and more importantly, forever altering the manner in which commerce is conducted. This is largely due to sheer numbers and projected longevity. However, with the character traits and hyper-connectivity that seem to be the internal compass of the "Y's", if you want to successfully employ them, you need to adjust the manner in which you communicate with them. They are without question, a unique species that resembles a constellation pretty much revolving around their own high-tech based universe and are more alien to other generations as anything society has yet experienced. This is a strong statement to be sure. However, if you require evidence, you only have to look around you the next time you are anywhere where this generation tends to congregate, which is usually any place that sells coffee and has a Wi-Fi connection. Who are they? From where did they come? Why can you call them and they don't answer, but send them a text and they respond immediately? If you think this social behavior does not affect the manner in which they work, think again. If you want to reach them, you need to learn to speak their language, which is mostly non-verbal. Being a Gen X-er myself, the child of a Baby Boomer mother, and fortunate to have had a father from the Greatest Generation, the 23 years between my parents age provided a tremendous platform to be raised on. We read books, the paper kind. We played outside until the streetlights came on. We played inside with boxes! We built forts out of sheets! We were goofy. I miss seeing that playfulness in Gen Y. because it's as if they seem to have skipped over their childhoods entirely. Honestly, playing Candycrush is not the same as playing Candyland. It's just not. And texting isn't the same as talking to your friends on a party line on a phone... with a cord. Now, if you are employing Gen Y be prepared. You must be technology driven or you will be left trying to figure out how to connect with your staff and getting zero results. Gen Y isn't going away, but they will be leaving you behind unless you make keeping up a priority. Make it a point to communicate frequently and briefly to a staff of Gen Y because your competition is a world of information and social media at their fingertips, accessed in a heartbeat. Your best bet is to communicate with them in as much as possible via text, email, and social media sites such as a private Facebook page for employees only of your company. This will give you a central place to post expectations and incentives, changes in policy, recognition, schedules, etc. Gen Y is actively pinging away like sonar looking for the next opportunity to grab a hold of. It's imperative to maintain a business that includes a target focused on forecasting room for a fast pace, unique, highly motivated work force and finicky consumer group. Gen Y is the future of business. They are making their own rules and playing their own way. Learn their game, play it better and win over a group of individuals who don't mind working hard, they just don't want to talk to you about it... so text them.